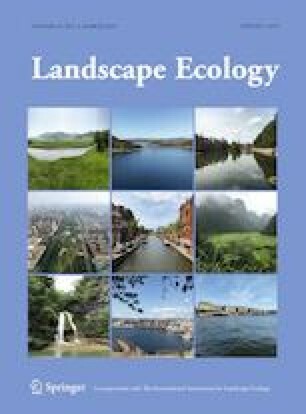 Boundaries may have crucial influences on landscape patterns, processes, and dynamics. However, there is little understanding of mechanisms that govern changes in the location and composition of boundaries. At smaller scales, investigation of detailed soil and vegetation characteristics can clarify the linkages between soil properties and vegetation patterns. The aims were to examine the relationship between vegetation patterns and soil properties, and to explore mechanisms that govern changes in the location and composition of boundaries. In a 50-ha grassland fenced for more than 10 years, where a recovery process had been initiated and annual grasses dominated in most saline–alkaline areas, we quantitatively characterized the spatial gradients across the visually identified physiognomic boundary between annual patches and perennial patches at a fine spatial scale. Fine-scale vegetation and soil boundaries were well-defined and statistically characterized by a high rate of change compared to immediately adjacent areas. Plant characteristics were markedly influenced by soil properties. The alteration of salinity and alkalinity were the most important factors explaining the plant patterns across patch boundaries. Successional processes of colonization were involved in perennial encroachment in the annual patches. Underlying soil properties primarily determine the plant patterns of the boundary; plant succession caused by interspecific competition is superimposed on the plant–soil feedback loop maintaining soil nutrient conditions. These processes alter the characteristics and locations of patch boundaries in response to changing disturbance regimes. Our findings offer insight into how boundaries may respond to changes in environmental conditions and drive landscape-level dynamics. The online version of this article ( https://doi.org/10.1007/s10980-019-00805-y) contains supplementary material, which is available to authorized users. We thank László Körmöczi for helpful comments on an earlier draft of this paper. This project was supported by National Key Research and Development Program of China (2016YFC0500602), National Natural Science Foundation of China (No. 31770520), the Program for Introducing Talents to Universities (B16011), and the Program for Innovative Research Team in University (IRT-16R11).